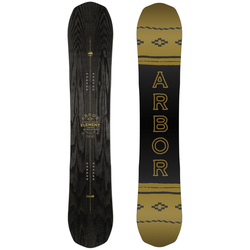 Spend your entire day riding and enjoying the mountain with this lively women's specific board from Arbor. 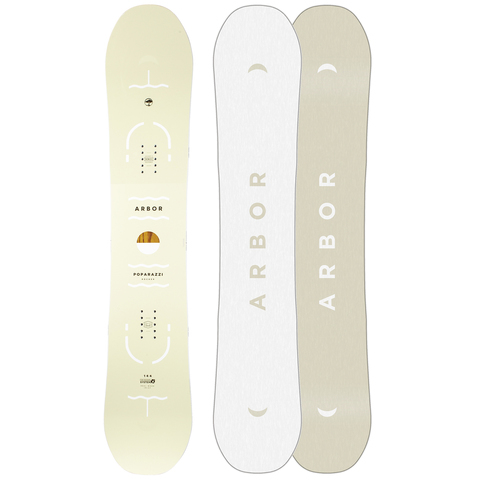 The Poparazzi Snowboard features a System Rocker for easier turning in hardpack and powder, with a Single Malt Wood Core for increased durability, and a more forgiving, yet stable, medium flex. All-mountain models are the daily drivers of snowboards. And because they’re for riders who ride the whole mountain in every condition, they’re typically designed to be capable on and off the trail—on groomers, in powder, and helping you adapt in variable conditions. But they’re not experts in any one terrain and there isn’t just one type of all- mountain board. The key is determining what type of riding you do most and then choose your go-to model. Twin shapes (sometimes called true twins) are symmetrical tip to tail, including their flex pattern. The twin shape allows for bindings to be mounted more centrally too, making twin models well suited to freestyle riding where spinning and riding switch is most common. Boards with full rocker profiles (also known as reverse camber) typically curve upward from either the center of the board or just outside the bindings. The profile offers better handling in powder and ungroomed snow, being more forgiving and allowing riders to initiate turns more easily and have a more maneuverable, playful experience overall. A softer board will be more forgiving and better for beginners and more playful for those who ride more park and freestyle or are light weight.